Maybe the best, most enjoyable thing about Tom Cruise's latest Bond-er-Mission Impossible outing is its sense of humor. There are moments that are borderline parody of the genre, the series itself, and of course Tom Cruise himself. Writer/Director Christopher McQuarrie directed Cruise in "Jack Reacher," and wrote the screenplay for "Valkyrie" and "Edge of Tomorrow," two other Cruise films. As such, he seems like a natural fit to take on the series. It was a wise choice. He made sure "Mission: Impossible - Rogue Nation" wasn't above joining in on the obvious jokes we make about movies like this. He's as enamored with Tom Cruise as much of the audience. Cruise can do anything, as ridiculous and unlikely as it seems, we'll believe it simply because it's Tom Cruise who is doing it. 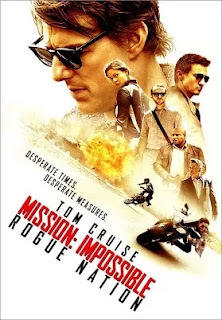 And let's face it pulling off the impossible is expected in a film titled "Mission Impossible." Comically Benji accepts a near impossible mission, calling it easy simply because Tom Cruise...er...Ethan Hunt is there and can handle anything. In fact, despite knowing his name is Ethan Hunt, it might as well just be Tom Cruise. At some point I started to wonder, if one of the other actors accidentally called him Tom during a scene, and the line somehow made it into the final film, would we even notice? It's an indication of how big a star he is, and just how much this series has become a part of him. Even if Mission Impossible is the American James Bond series, most actors to take on the role of James Bond become known as James Bond, to the point where you can't look at the actor and not think of James Bond. Ethan Hunt is the opposite. He is Tom Cruise, so I'm sure I'll be using the names interchangeably from here on out. The film opens with one of the most Tom Cruise-iest moments in the series, with him running and jumping on a plane carrying nuclear warheads. He holds onto the side of the plane with his bare hands till his faithful hacker friend Benji finds a way to open the door (a stunt Cruise actually did... with a proper safety harness I'm sure). As the door swings open, he's sucked inside, tossed around hard, rattled but not incapacitated. It's an indication of things to come. He takes a beating in all of these films, perhaps none worse than what he endures in this film. The CIA, or perhaps just Alan Hunley (Alec Baldwin), doesn't like the IMF's methods, and a hearing committee agrees calling them "indistinguishable from chance," and their results "look suspiciously like luck." This is confirmed in a later scene involving a dangerous jump into an underwater security system to swap the disk containing important security information in order to make the whoozits grant Benji access to steal the whatsits. The plan and completion of it (not to mention the lives of those enacting it) end up relying on luck, but then again do we imagine there's anyone in film luckier than Tom Cruise? Even if he ends up drowning, a well timed defibrillation will have him back on his feet and entering a dangerous, high speed chase in no time (even the trailer spoils this leaving us with no concern whatsoever). But that's what it takes to save the world, and it's all in a days work for Tom Cruise. It's a wonder, and a credit to writer/director Christopher McQuarie, that my simultaneous thoughts could be, "I'm not sure what's going on here" and, "this is great." It isn't to say that the plot and its characters don't make sense, but there is enough back and forth that we don't know who to trust, or who the bad guys really are. Thankfully we're grounded by Tom Cruise and his cast of usual suspects. They're Benji Dunn (Simon Pegg), the aforementioned hacker, William Brandt (Jeremy Renner), who has a smaller part this time around (he's been an Avenger, a super soldier in the Bourne series, and now a rogue IMF agent), and series favorite Luther Stickell (Ving Rhames). Brandt is the only one whose loyalty is questioned. The reason his loyalty is questioned is because Ethan Hunt, and his "unorthodox methods" are out hunting a white whale in the form of an "anti-IMF" team called the Syndicate. It's run by the evil, glasses wearing Solomon Lane (Sean Harris) who speaks with a sinister, whispery, raspy voice in every scene he appears. Worse yet, he outsmarts Ethan capturing him in a glass box filled with some sort of knockout gas. Nevertheless, the IMF is shut down, and Ethan, having escaped captivity, becomes a wanted man, because no one else is convinced this Syndicate actually exists. Yet as good films do there is also topical references spread throughout. We're all aware of flights that have mysteriously crashed, or simply gone missing (like missing Malaysian flight 370), and other events from world news. Mission Impossible frames similar stories as the work of this terror group. Joining Ethan, while his IMF buddies are busy with the CIA, is British secret service agent Ilsa Faust (Rebecca Ferguson) the female Tom Cruise of the film. She looks a bit like Lauren Bacall, whose husband Humphrey Bogart was in Casablanca, and there is, of course, a scene that takes place there. Only she could make the jump into the water security system to save a drowning Tom Cruise, although her loyalty is questioned even more than Brandt's. Her situation is far more complicated than anyone else's. She's undercover, having infiltrated the Syndicate's operation, but the trust she has with their mysterious leader is constantly questioned, now more so than ever. She's playing three sides at once while trying to keep those sides from turning on her. Even when she betrays Ethan and his IMF friends, there's a hint that she's still good because at least she saved his life in the process. He returns the favor in the most James Bond-esque scene in the film. While wearing their fanciest attire and attending the Vienna Opera, henchmen assemble weapons that had been made to look like instruments. A little research unveils the Opera to be Puccini’s "Turandot," in which an amorous Prince and Princess test each other. The song returns several times later in the film as their orchestral theme whenever they're on screen together. Whether or not Ethan and Ilsa are a romance or not is irrelevant. They're closer than friends, because they've placed their lives in each other's hands repeatedly, and they can only rely on each other. Whether we're sure or not, there seems to be no doubt about loyalty between the two. When they're not betraying each other, they're working on revenge against Solomon Lane for having outsmarted Ethan in the first place. The aforementioned parody extends to a smaller, less noticeable moment in which Ilsa and Ethan escape the Vienna Opera after gunshots draw the attention of local law enforcement. She pauses just long enough to ask him to take off her high heels. It's as if the moment were added after the release of "Jurassic World," and the comical backlash from viewers that Bryce Dallas Howard's character spends the film running from dinosaurs while wearing high heels. The moment would otherwise be wasted if not for the overreaction from earlier this summer. This light-hearted nature is a welcome one after the more serious tone of the previous installments. It doesn't however, keep the more serious threats from mattering. It's a good balance, and the mark of a talented writer/director. It's already leading at the box office. It seems to have been a savvy move by the powers that be to move the release date up from their originally scheduled December release. It allowed them to move away from stiffer competition like Star Wars (December) and James Bond (Spectre). It fills a time slot that gave much success to Marvel and Disney's "Guardians of the Galaxy," and faces minor competition. It's the best box office numbers Tom Cruise has seen since 2005's "War of the Worlds," begging the question just how many of these films can, or will be made? At 53, Tom Cruise still looks like an action star, and still does his own stunts. Speaking of which, the chase sequences are brilliant. It is perhaps the best motorcycle chase I've seen since the Matrix Reloaded (no matter how you feel about that film as a whole, you have to admit it was a great sequence). However the question remains, how long will audiences accept him as the leading man in action films such as this? My guess is, he still has a good number of years left in him. Meanwhile this is one of the best Mission Impossible films yet. It's certainly the most fun. We should count ourselves lucky to be living in the age when these memorable actions stars were still working at their peak.